We just received a letter from a Mercy graduate that we wanted to share with you. Justice graduated from the Nashville home in February 2008, and we were thrilled to hear of her recent academic success. She came to Mercy Ministries during her junior year of high school and diligently continued her studies during the program. I was writing to say thank you for an inspiring program that helps girls like me. Being at Mercy not only allowed me to gain spiritual and mental knowledge, but I am also getting my high school diploma a whole year ahead of time! I was supposed to be graduating in May of 2009—but because of the self-study courses at Mercy, and the grace of God, the Christian school I came back to attend not only took my credits, but told me that I was ahead! I only had to take 3 classes to finish my senior year. I recently graduated on July 27, 2008. I am looking forward to my future. 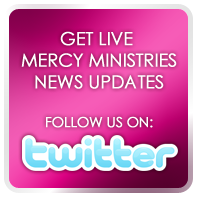 I even dream of one day working at Mercy Ministries – the very place that saved my life! Congratulations Justice! We are thrilled that you are accomplishing all that God has for you. Thanks to all of our supporters for contributing to an awesome future for girls like Justice. Your support makes it possible for Justice and many other Mercy residents to continue their education while getting the help they so desperately need.